I’m like a caged animal. A middle-aged, drowsy, impatient, bored out of his mind, tensed-up caged animal. My officiating season starts in just 803.5 hours, give or take ten minutes. Oh sure…I’ll “warm-up” with some middle-school games, those are always nice to start a season with, but the meat and potatoes of my season, the serious stuff, the stuff that really matters will start on Tuesday November 22nd. I read the rules book in August. (it hasn’t changed). The new rule book arrived Monday. One major change from last year…e-cigarettes are banned from the bench now. Who has two thumbs and never thought that he’d see THAT in the rule book? THIS GUY!! I’ve been watching training videos of games, gone to a clinic and daily read through more training books. Honestly…it’s pretty boring stuff. I can’t wait to get out there on the court. I worked a preseason girls basketball league this fall, for the fourth year. That’s always fun. Informal yet serious. It gets me some court time and a little spending money to boot. 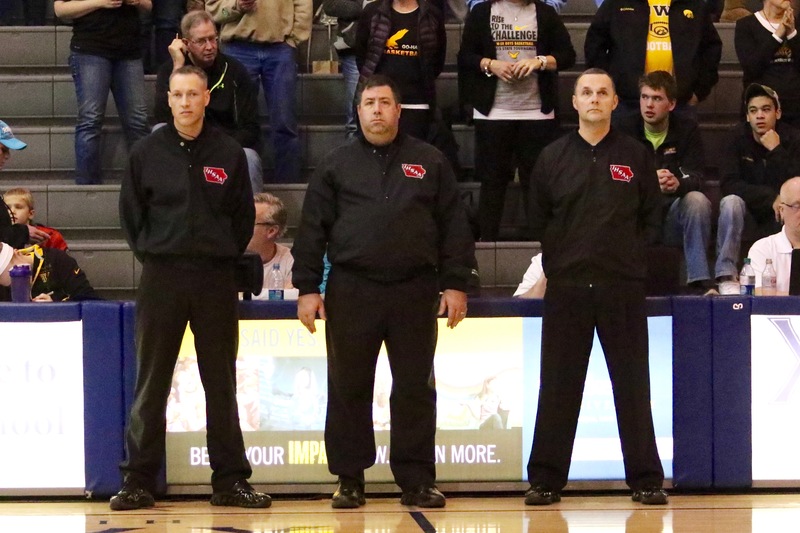 When I first started officiating five years ago I’d work any basketball tournament that I could. 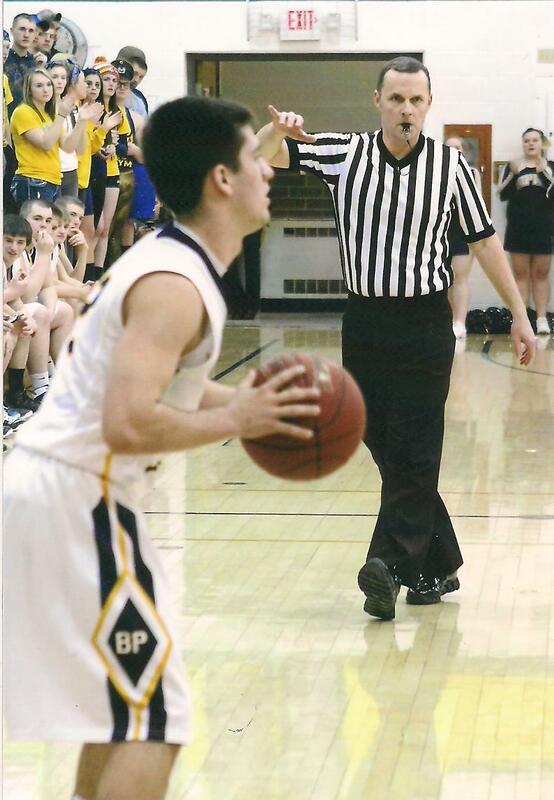 In the first two years of officiating I worked around 340 games…mostly AAU type of games where the parents and coaches scream and everyone has aspirations of “little Madison” or “little Dakota” getting a full-ride athletic scholarship to a D-I college. I worked them to gain experience and money. For the past two seasons I’ve avoided the majority of those tournaments. The play is usually marginal. The parents and coaches can be overbearing and it can be a crapshoot on who you’re working with as a partner. Don’t get me wrong…there’s many good coaches and caring parents but I usually shy away from that environment. Instead I’ve decided to work a few little kid tournaments where they’re just starting out. Double-dribbling, traveling and three-seconds are usually overlooked in place of helping them learn and making the game fun for them. For me…the reward, get new players into the game that I love and having them learn and have fun too. The other reason that I don’t work as many weekend tournaments is…at the tender age of fifty, I just can’t work five or six games a day and be my best. Honestly…I usually don’t get yelled at much when I do those games, even if they’re bigger kids games. It probably has more to do with me being a much better official now than when I started out. I put these photos together on a meme generator. 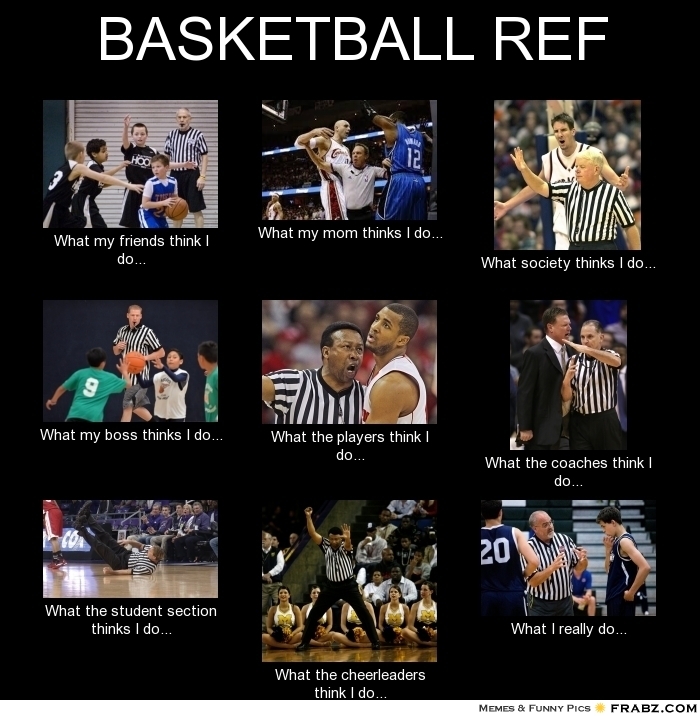 It’s how I think folks around me view my officiating. My two goals for this season are being patient with my calls and being a better communicator with coaches. Sounds easy enough, yet it was a struggle last season and drove me crazy. To be honest, those two are connected I suppose. So…long story short. I can’t wait for this season. The games. The road trips. The camaraderie. The stories told and re-told. The laughter. The pregame in the locker room. The athletes. The echo of bouncing basketballs in an empty gym as we arrive. The excited chatter of fans before the game. The great plays. The blocked shots. The three-pointers. The drive to the lane where the defense is set up to take a charge and the dribbler dishes to a cutter who lays it in uncontested. The three-quarter court press with ten seconds left. The pep-band belting out BTO’s “Takin’ care of business”. Checking the scorebook. Working with the table. The explosion of sound from the bleachers on a block-charge. The rowdy student section. The smell of popcorn and the squeak of sneakers. Its constantly learning. Its being blessed to be on this crew and getting games from our assigners. It’s talking to players when no ones looking, asking them to clean up their game or they could pick up their third foul of the half. Grandpa and Grandma sitting in the second row. The starting line-ups. Our national anthem. Witnessing good sportsmanship close up. The non-verbals from Lead to Center to Trail. The post-game break down on the drive home. The satisfaction of knowing that we got it “right” even if the crowd/coaches/players beg to differ. It’s knowing that my crew has my back, and I have theirs. Its seeing the conference standings shaping up in late January and knowing that we have a possible “clash of the Titans” type of game for first place in the conference on a Friday night. (the gym will be packed!!) The anticipation of receiving a post-season assignment. Game management. Seeing a third-stringer hit a three-pointer during garbage time and hearing their bench and the gym erupt. Watching a team come back, the time out to stem the tide and letting the game play out as we watch for fouls, violations and another time out. Its mentoring new officials how I was taught. Its months later when a person sees me in public and tells me that they saw us work a close, hard-fought game at their school and letting me know that our crew did a really good job. Its the anticipation of working a game that adds excitement and possibilities to my work day. It’s all good. Its in my veins. I’m addicted.